Glioblastoma is a type of brain cancer that has recently been quite visible in the media after Sen. John McCain was treated for it. Glioblastoma claimed the lives of over 15,000 people in 2015. However, researchers at Duke University are working to reduce that number through “oncolytic virus therapy” from an unexpected medical foe: The poliovirus. What is oncolytic virus therapy for cancer? It's a type of treatment from a branch of cancer care called immunotherapy where human viruses, which can fight cancer in different ways, are modified in a lab and used to fight cancer. Through oncolytic virus therapy, the viruses can stimulate the immune system, the same system that fights disease like the flu, to also attack cancer. With this particular form of therapy, the viruses can also infect cancer cells themselves, making them break apart and die. Viral therapy arose many years ago when spontaneous tumor remissions happened after immunizations with live, weakened viruses. There have been studies using viral therapy in lung cancer and melanoma, with an actual viral therapy approved for melanoma by the U.S. Food and Drug Administration (FDA) in 2016. 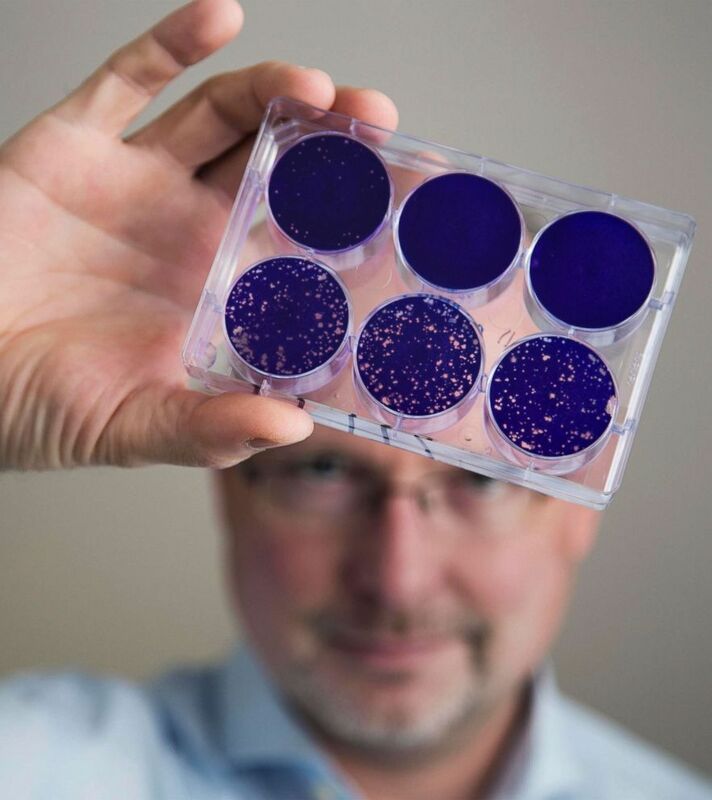 In this Aug. 8, 2013 photo provided by Duke University, Dr. Matthias Gromeier holds samples of the modified poliovirus he developed to attack glioblastoma brain tumor cells at Duke in Durham, N.C.
Why use it to treat this brain cancer? Brain cancers are rare but if someone does develop brain cancer, it's likely to be glioblastoma. Unfortunately, it has a poor prognosis, with most patients dying about 14 months after it’s diagnosed. That's not just because of a high tendency for malignancy, but also because of its resistance to current cancer treatments: surgery, radiation, and chemotherapy. The reality of the glioblastoma prognosis has caused some patients to choose to end their lives soon after diagnosis. New treatments are desperately needed, and this particular type of cancer has characteristics that make it an ideal candidate for viral therapy. A live poliovirus is used, weakened by a process in the lab. It’s important to note that live, weakened viruses have been commonplace for years and are critical components of many vaccines worldwide, such as the poliovirus. In the case of oncolytic virus therapy, the poliovirus is genetically modified so that it works like its regular viral self but does not have the ability to cause its “normal” disease. The disease-causing part of the poliovirus, infamous for causing a devastating neurological disease, is taken out and replaced with a part that is harmless. To the immune system, it looks like “the real polio” but does not have the ability to cause the disease, or even mutate to anything that could cause it. This is important, as the modified virus has to maintain the ability to affect the same target, the brain. The virus is also further modified to include components that would stimulate one’s immune system to fight back. Glioblastoma patients often have poorly functioning immune systems, both from the disease and also from treatments like radiation that knock out immunity. By inserting a new segment into the virus, like from the common cold, the immune system gets active without any actual illness. A strong immune system reaction draws cells toward cancer to attack it. Because cancer cells work differently than normal cells, the genetically modified virus interacts differently with cancerous and noncancerous cells. Cancer cells from glioblastoma have different chemical components than noncancerous brain cells. The genetically engineered poliovirus thus has the ability to target cancer cells, infect and take over the cell’s machinery, and encourage a person’s own unique immune system to attack. It does this while leaving non-cancerous cells untouched. 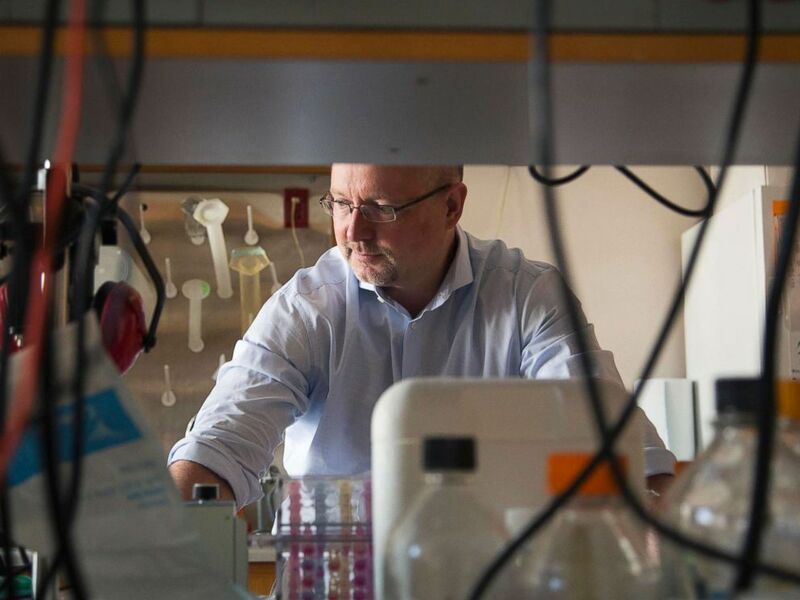 This Aug. 8, 2013 photo provided by Duke University shows Dr. Matthias Gromeier at his laboratory at Duke in Durham, N.C.
Human viruses are unique, co-evolved with the human immune system, teaching it to recognize and kill infected and abnormal cells. Poliovirus has a large RNA size (RNA is a genetic component), in comparison to other viruses so researchers can play with its parts in genetic manipulation. It also has a limited lifespan in humans, unlike other viruses, such as chickenpox. Thus, it has the potential to be used to treat a number of different kinds of cancers. What have been some of the results? Using polio as a "cancer-killing virus,” researchers at Duke have seen a survival rate at three years of about 21 percent in patients with brain cancer who got the oncolytic virus therapy with the poliovirus. Survival was only 4 percent for those who didn’t receive the therapy treatment. The therapy has been able to be given locally in the brain’s tumor site through a special catheter. This allows more “seeding” of the virus into tumor cells and not spreading throughout the body. Many patients have been able to tolerate the poliovirus therapy well, but some have had side effects such as seizures, headaches, and speech problems. Too much of an inflammatory response can be a bad thing. Higher doses of the poliovirus therapy treatment were associated with more inflammation to the brain. Researchers have been working to address dosing and minimize inflammation without compromising an immune system boost by using bevacizumab, a drug to minimize inflammation during the viral treatment. Poliovirus therapy is still in clinical trials and not ready yet for the general public. Big questions are potential cost, as some current viral therapies are about $60,000 per treatment and the ability of hospitals to transport, store, and discard these drugs are concerns for patients and providers. Where can one learn more? Immunotherapy is still a developing field. Talking to a medical professional and keeping up with results from quality sources, like the Centers for Disease Control and Prevention (CDC) and American Cancer Society, are important ways to find out more. Petrina Craine is an emergency medicine resident physician in Oakland, California, working in the ABC News Medical Unit.